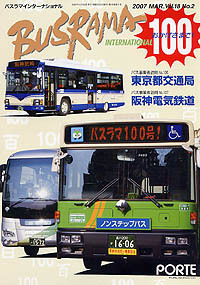 In the issue, we had visited to bus operators of Tokyo Metropolitan Area and Kinki Area. The Tokyo Toei Bus, or the Tokyo Metropolitan Tranportation Bureau, is operating 1,500 buses in Tokyo, trannsporting more than half a million passengers daily. They started bus operations since 1924, after devastating earthquake ruined the Tokyo's tramways. Since the bureau operates buses in the capital of Japan, they are keeping influential position among the Japanese bus manufacturers. Hanshin Dentetsu Bus or Hanshin Electric Railway Bus, and its subsidiary Hanshin Bus, are operating routebuses along the Hanshin rails in Hyogo Prefecture, western Japan. Hanshin Dentetsu started its rail operations in 1899, but bus operation started since 1949. In 2006, they spun off a depot as Hanshin Bus. Now they are operating 150 buses, transporting 50 thousand passengers daily. In snowy areas in Japan, it is necceserly to set chains to bus but it was a hard work for drivers. The JR Hokkaido utilises a light weight, easy to set chain called "Cable Chain" on their fleet. Nissan Diesel 4Rs were rear-engined bus with two-stroke diesel engines. The first 4R made its debut in 1960, received face lifts in 1965 and 1970, and kept production since 1973. They were mainly used as city buses but some of them were used as touring coaches.